Are your AdWords campaigns working… like, really working? That might be a surprisingly hard question to answer. Anybody with an AdWords account can see if they’re getting clicks, and it’s not too hard to set up conversion tracking — but chances are that the reason you put money into AdWords was that you wanted to get money out. In other words, you want your ad spend to produce sales. As obvious as this statement is, actually determining how different factors in your AdWords campaigns affect sales can be fairly difficult. To try to shed more light on the subject, we recently conducted a study on how different variables affect ad performance at Disruptive Advertising (my company). We pulled data from well over half a million keywords and measured return-on-investment against dozens of variables. In short, we wanted to answer the question: What predicts profitability in an AdWords account? Our findings may surprise you. With any pay-per-click platform, the more clicks cost, the less profit you’ll make. However, many businesses are quick to argue that if a new sale is worth enough, it’s worth it to bid on keywords with expensive CPCs. But do things actually work out that way? Now, for these companies, a sale was worth anywhere from tens to thousands of dollars, so you’d think that at least some of their keywords would perform well at a higher CPC. But it didn’t work out that way. Based on the above findings, it seems like long-tail keywords would be the way to go. After all, the longer the keyword, the less competition there is and the cheaper the click will be. However, that only works up to a point. When we looked at how keyword length affected ROI, we found that the most profitable keywords typically had 15 to 30 characters. The keyword has good volume and intent but is way too competitive. Despite all these clicks, this search term had never produced a single conversion. Why? Well, people who bother to type in a 96-character search term like this are usually looking for a very specific answer — the kind that you get on a forum or answer board, not a landing page. If you have a conversion rate (CR) of 5 percent and a click-through rate (CTR) of 5 percent for a given ad, it’s easy to assume that doubling your CTR will double your conversions. While that may be true in some situations, as a general rule, increasing your CTR actually tends to decrease your conversion rate. In our study, higher CTRs were typically associated with lower conversion rates. Let’s take another look at that e-commerce data we were talking about earlier. As you can see in the graph above, as CTR improves, the conversion rate plummets. But why? 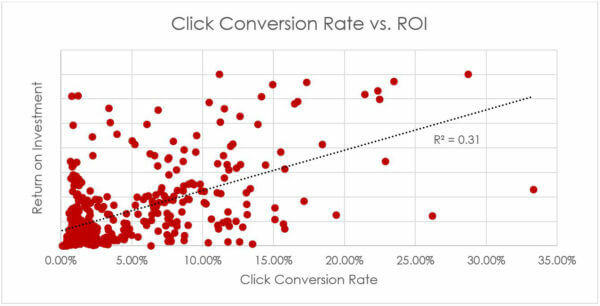 Since people only click on ads that they think match their intent, wouldn’t a higher CTR lead to a higher conversion rate? Unfortunately, that only happens if you are targeting the right audience with the right message. In many cases, CTR improves because you are targeting the wrong audience with the wrong message (or at least an unclear message). As a result, they think they’ve found what they’re looking for, only to end up on your landing page and discover that your business isn’t what they really want. Sadly, this is where the clear data ends. Although AdWords experts love to say, “Pull this lever and you’ll make more money,” it doesn’t work out that way in practice. At first glance, this graph looks great! I mean, look at that trend line. Clearly, the higher your conversion rate, the more profitable your campaigns will be, right? While this graph looks compelling, there’s a problem. If you take a close look at the graph, it’s pretty clear that the dots don’t really follow the line. In other words, the trend line doesn’t do a very good job of predicting real-life results. In statistics, we describe how well a trend line fits the data using R2 (R squared). In the case of the graph above, the R2 value is 0.31, which essentially means that the trend line is only accurate about 31 percent of the time. In our study, we found that the best predictors of ROI were the amount of time spent on a page and the number of pages visited. That’s kind of a no-brainer — if you’re converting, you’re going to spend more time on the site and visit more pages. But it’s hard to use that data to improve campaign performance. After all, forcing someone to visit more pages and spend more time on your site isn’t likely to get them to convert. But what about all the other metrics we love to watch? How does modifying those metrics affect ROI? As you can see above, the very best predictors of ROI are CTR and CPC. But even those factors only have R2 values of 0.27 and 0.19, respectively. A 27 percent and 19 percent success rate aren’t exactly the kind of wins you want to wager money on. Now, that being said, these numbers are based on our whole data set. When you group companies with a $0.25 CPC and a $10 product with companies with a $25 CPC and a $1,000 product, your data are not going to be very consistent. In this chart, I’ve assigned bronze, silver and gold medals to the top predictive factors in each CPC range. As you can see, hashing out the data in this way does improve the predictive value of each of these factors, but our best performer is still only accurate about 50% of the time. So, regardless of what you may read out there, there is no “silver bullet” for AdWords performance. Improving your CTR, ad position or conversion rate might improve your ROI, but it’s a shot in the dark. Really, when you get right down to it, every business and market audience is unique, which means that the only true “silver bullet” may be blood, sweat and tears. That being said, these data may be a bit of a relief to you. After all, if improving these metrics doesn’t reliably improve ROI, that means you can spend less time worrying about your CTR and more time identifying new, creative ways to reach and influence your target audience. If you’re focused on creating profitable ads and campaigns, rather than improving surface metrics like bounce rate, you’ll probably end up with better results.